For What It's Worth: Happy Follow Friday, Book Blogger Hop Day! Happy Follow Friday, Book Blogger Hop Day! Q. Name 3 authors that you would love to sit down and spend an hour or a meal with just talking about either their books or get advice on writing from? Well I have met and talked to Jeri Smith-Ready but I would like to do it again. She's very funny and smart and always get more insight into her stories and writing. Ann Aguirre would be another. I love her writing - I might scare her though since I would mostly bug her for Outpost spoilers (the sequel to Enclave) My third would be Suzanne Collins and it would not be an enjoyable dinner because Iw ould have to ask her what the hell was she thinking while writing Mockingjay?? The style is so different, I don't get it, it drives me crazy and I'm dying to know. Q. What’s the ONE GENRE that you wish you could get into, but just can’t? I would have to say fantasy. I love the IDEA of it and sometimes like portions of a book but it's very difficult for me to get into a high fantasy book for very long without glazing over. The worlds are often too descriptive at the expense of action and moving the plot forward. Perhaps I haven't found the right one yet. Sign up for the Ultimate Reviewer's Challenge while your here! A month long event just for bloggers where you get to link your reviews for a chance to win one of three awesome prize packs! Oddly enough, I love Fantasy but can't get into paranormal. Nice little bit of symmetry there. i love high fantasy =) it can get boring and most are very long but there are some that are so amazing! Great answers! Don't hurt me, but I haven't read any of those authors yet, but they are on the list!! I'm already a follower. My answers are up at Coffee Table Reviews. If you ever decide to give it another shot I suggest Poison Study by Maria V. Snyder and/or The Demon King by Cinda Williams Chima. @Sandy - I have the Dystopian series by MVS (Inside Out) but I haven't read anything by her yet. I do hear a lot of good things. I also have an ARC of book three in the Seven Realms series by Cinda Williams Chima - Is that the series your talking about? I haven't read anything by her either. I've only heard of Suzanne Collins...I haven't read her books though GASP! I know I must say this EVERY week, but I love the bunny! 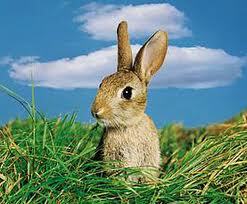 Hi there, I'm hopping through and following you. I hear you about Suzanne Collins. If I had dinner with her post-HG or post-CF, I would be dreamy-eyed and being a complete fangirl, but post-MJ I would be at a loss as to how to handle the discussion. "How could you do that to Peeta, Suzanne? How?" Wouldn't you love to be able to ask an author you really like what they were thinking when it came to a particular book? I haven't read the Hunger Games series yet, though I know that I should! I think high fantasy can be a tough genre to get into --- I tend to go for lighter fantasy, myself. Just blogging by, happy Friday! I love the descriptiveness of high fantasy, depending on who you're reading, as Terry Brooks was a bit much for me. Suzanne Collins is a great choice. She would've been my other choice if I could pick four authors. I love Suzanne Collins! The Hunger Games is amazing! Nice picks :) Here's my FF if you want to check it out! Hopping through. I'd love to meet Suzanne Collins. I'd like to learn how she does such a great job writing action and world-building. I used to inhale High Fantasy when I was younger and still have a soft spot for it, but it would take me AT LEAST one week just to read a single book, hehe, so - yeah - I get what you're saying. Awesome answers. I'm your newest follower. © For What It's Worth: Happy Follow Friday, Book Blogger Hop Day!